Always attention to detail, technical skills, passion in our work and great attention to customer needs are the strengths that have allowed us to excel in the field of sale of "Starter Kit" Iwata Eclipse HP-CS. Consultando il catalogo di Aerografando you will immediately notice how vast it is and how diversified the model range is Starter Set, you will find the best "Starter Kit" Iwata Eclipse HP-CS offers at the best prices on all "Starter Kit" Iwata Eclipse HP-CS of the brands Iwata. · Automotive artists, fine artists and students will appreciate how well the Eclipse CS sprays heavier acrylics and Medea Textile Colors, while maintaining high-detail spray characteristics. 3,05 mt braided hose with 1/8" fitting for airbrush and 1/4" for compressor. Highly concentrated and ready to use. Read the reviews of our customers on "Starter Kit" Iwata Eclipse HP-CS of the category Starter Set. 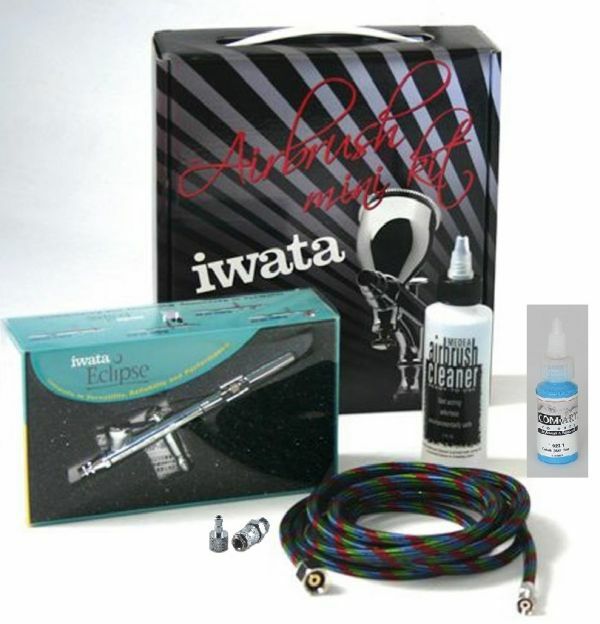 Review "Starter Kit" Iwata Eclipse HP-CS of the brand Iwata. Trust in the quality and professionalism of Aerografando on the sale of "Starter Kit" Iwata Eclipse HP-CS, only from us you will find the best prices. You want to have more details on "Starter Kit" Iwata Eclipse HP-CS AKES002 or more generally on ours Starter Set? You are looking for a Starter Set but do not you find it in the catalog? Staff of Aerografando will answer all your requests.